Add a touch of style to your patio with the Zamora 7-Piece dining set. 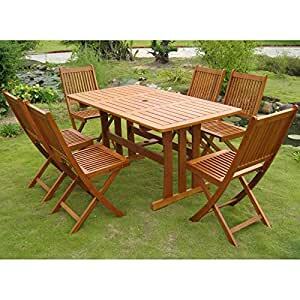 Features folding chairs (17w x 23d x 36h) for easy deployment and storage along with a rectangular table (59L x 32w x 29h) with umbrella hole. Made from natural yellow balau wood that is durable and sustainable with a natural wood finish.